H-bridge is frequently used to control DC motors and stepper motors. 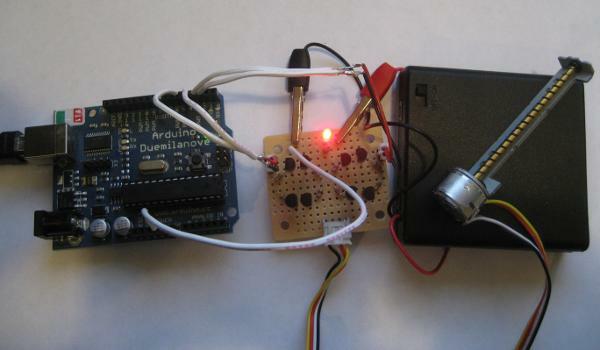 When controlling a bipolar stepper motor, two full H-bridges are needed. There are many H-bridge ICs (like L298, MPC17529 and SN754410 which is a quad half H-bridge) for just that purpose. 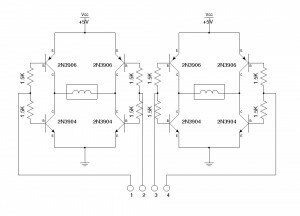 But if you are on a budget, you may want to consider building a dual H-bridge yourself. 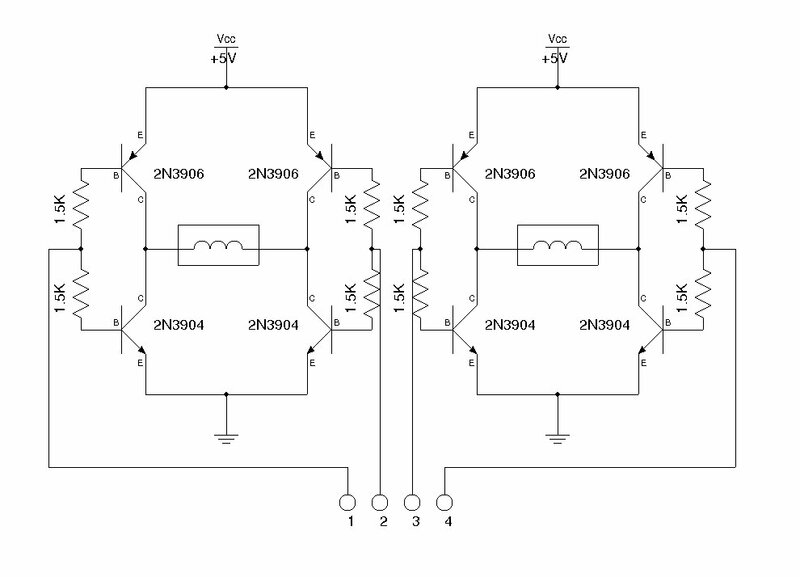 The following schematic shows a simple dual H-bridge using eight general purpose transistors (2N3904 and 2N3906). Given the maximum Iceo of roughly 200mA, this circuit can be used to drive a small bipolar stepper motor operating between 5V and 12V, such as the stepper motors found in most floppy drives and CD/DVD drives. 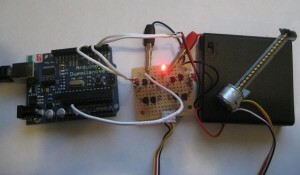 The four control inputs (1,2,3,4) can be driven with Arduino‘s digital pins (i.e. 2,3,4,5) directly. The following program illustrates how to signal the four leads of a bipolar stepper motor for it to rotate. Of course, there’s already a stepper motor library built for this purpose. The program below is helpful when learning the sequence of the pulses required by bipolar stepper motors. Here is a picture of an Arduino controlled CD-ROM stepper motor (the one controlling the tray mechanism) powered by the above dual H-bridge (with an added LED for power). The PNP transistors in the original schematics had C and E swapped. This has been corrected with the latest schematics update. How long do you pause between each stepping? If you put your fingers on the shaft, you should be able to feel vibration if the stepping sequence is wrong. Otherwise, you might want to increase the delay a little bit and see if it helps. I’d check the stepping sequence first. the stepping sequence is the same as yours (as u can see in the correct sequence(posted)), what is quite funny after placing the motor back to the cd-rom housing it start giving me a better response sometimes it was even menage to do around 10 steps, like it need some sort of resistance force on the shaft. Another thing, do you think by soldering cables on the motor coils I could brake the connections, because my one have like thin bus tape connected to the motor coils and what i did i just soldered another cables on top of them to connect my motor to the board. hi. can i ask if this circuit would be compatible also with my stepper motor Nema 17?(4500gm-cm)3.6v,1.2mA? ?